When I was last in Lisbon I noticed dope work by the artist Pariz. 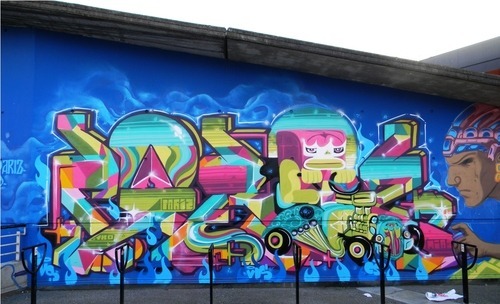 You’d instantly recognize Pariz’s work by his colour palette, letter style and fills. 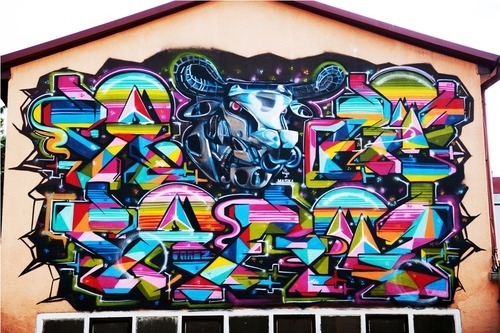 Pariz’s work is colourful to say the least but there’s also a futuristic sense that comes from the tessellated blocks of colour within his pieces. Despite the complexity of the internal elements and colours, Pariz’s overall work still has balance and flair. I was born in a Portuguese island called São Miguel-Açores; I came to Lisbon when I was 13 years old, so it was in Lisbon that I got all my roots and initiation to graffiti culture. I started making art in the late 1980s (well my Mom and family called it art at the time); I began writing graffiti in the late 90s. It all started with a can for windows [fake snow perhaps?] in the Xmas season, then I started to notice some tags and pieces in the street. I fell in love with the colours, the big letters, the adrenaline and the game. As I normally say the name Pariz chose me, One day I was doing a project and the letters started coming out one after another and it was very spontaneous, like everything I do in life. My big influences are life, my daughter most of all, new school graffiti, New York and French old school graffiti, TV cartoons, comic books and music. Talking about artists… there are so many I could name (I’m lucky that most of them are my friends)! I think that the true meaning behind my art is life, it can sound very “cliché” but it’s true, my murals sometimes are reflections of my daily day situation, and you can see that in the colors for example. My color blending is very spontaneous. Over time I have created new ways of mixing my colors; I kept the best techniques from over the years and now when I’m painting I reunite small parts of each past technique with new ones. The result is what you can see in my pieces. In the last 6 years I’ve organized expositions, walls and jam´s in Portugal. I’m directly connected to GAU (The Gallery of Urban Art) in Lisbon and events such as Write 4 Gold. I didn’t study fine art and I don’t criticize those who did or do but I think that in part my style can be considered original because I didn´t suffer from influences and barriers that studying art can provide. This way my style can be more free and wild. I do graffiti and I will always do it; I present my style as a “new old school style” and the development of my art came from that: from the old school feeling and the new school innovations. I do some gallery shows - I love to paint all kinds of supports and to use mix techniques. Galleries bring my wild art to a cage; I have to be extremely creative to bring to this cage my own environment and to transmit this environment to all kind of viewers. 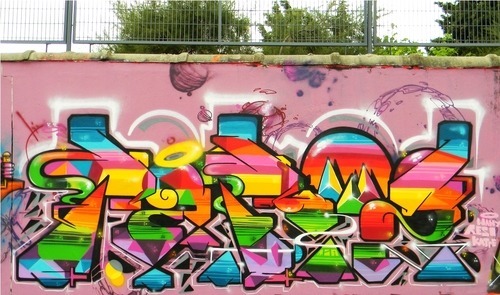 I’m from Lisbon, as some of my friends call it “graffiti paradise in Europe” and it is. Lisbon is graffiti friendly, giving opportunities to writers. 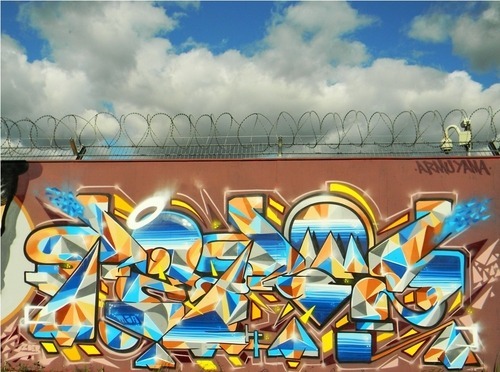 We have legal walls, graffiti projects, graffiti jams, expositions and so on. The public now see us as artists in general and the police have started to get used to it. I´m lucky I have travelled to many parts of the globe. Each country (or even each city) gives me a different perspective and different ways to think and talk. It’s true that with the internet we live in a global city, but the internet doesn’t let us the taste the food, smell of the air or see all the hidden factories and emerging writers. In future I hope to go to places that I have never been to before, get to know more people, new cultures and most of all to go back to places that I consider home, to see the family that I have been building in the past years. All that will make me happy and naturally make me grow up more as a person and as a artist. 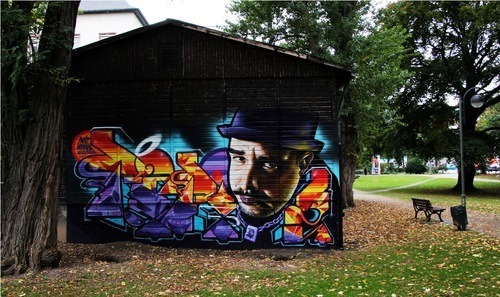 Thanks to Global Street Art, especially to Lee for the interview, big up to my crews GVS, VDS, TKO, CSF, ARMU-YAMA, my brand MMW, the Graff Beasts and to my graffiti family Wildboys, Katre, Mr.Dheo, Mr.Wany, Trun, Ekors, Ogre, Rekor, Chas, Markus, Jochem, a lot of names to mention you know who you are. Mia - Daddy loves you.